So, I made a little video for today's post. And this makes me feel totally insecure. Why am I insecure? I don't know. I shouldn't be! I wanted to make the video because I read a lot of blogs, and I always love it when I feel like I know the person writing the blog. It's great to read the About Page, but when you see someone on video, it's so easy to figure out what they're really like instantly. I guess this video is my way of letting you get to know me better. I think that's what people mean when they say, "Put yourself out there." It's a little scary. For sure. But I think it's worth it. UPDATE: Rather buy salsa instead? 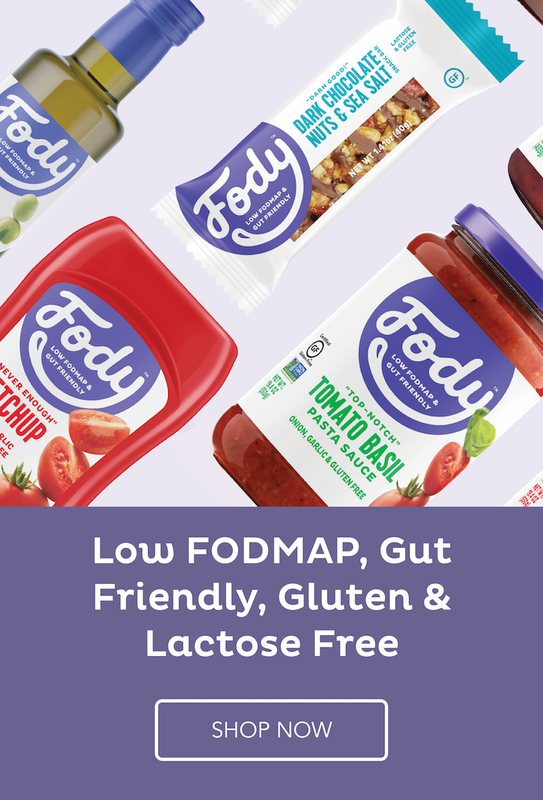 Fody sells low-FODMAP certified salsa! Okay, tell me what you think (Be honest, but also super nice!). Let me know if you want to see more, or if you don't care for it so much. This is not professionally done (obviously!). I used the natural light in my kitchen, and it ain't perfect. But it was fun to make. UPDATE! I just posted a new recipe you can make with this salsa, and it's good. Check out my Huevos Rancheros with Low-FODMAP Refried Beans (the beans are made with canned lentils, and 46 grams is a low-FODMAP serving!). When I started writing this, I went into a very long, kind of boring explanation of how I choose my ingredients and use the Monash University Low-FODMAP Diet App when creating my recipes. It was waaaay too long-winded to include (trust me! ), so I created a Frequently Asked Questions page instead. Please take a look if you want to know more about the recipes on this website. Anytime you need it, the FAQ link will be in the navigation bar at the top of the page. Now that the boring business stuff is out of the way, let's talk about the recipe! Of course, this salsa is great for dipping, but one thing I really love to do is make Mexican rice! I use brown rice for extra fiber and flavor it up with the salsa. Sounds simple, but it makes for a side dish that's so much more enticing than plain old steamed rice. Not that there's anything wrong with plain; plain can be wonderful. Jalapeno peppers have not been tested for FODMAP content yet. If you are in the elimination phase, you have trouble with spicy foods or you haven't tested jalapenos yet, use one of these excellent alternatives: 1/2 cup diced green or red bell pepper; 1 to 2 small red chiles (Red chiles are usually on the hot side, so be cautious. Recently, I started making this salsa in the food processor, which I LOVE. The instructions for that are included below. In a large bowl, combine all ingredients. Adjust seasoning to taste. Keeps in the refrigerator for about 5 to 7 days. FOOD PROCESSOR INSTRUCTIONS: Combine all ingredients in a food processor. Pulse unHl combined and the texture is to your liking. Adjust seasoning to taste. Keeps in the refrigerator for 5 to 7 days. I like some hot sauce in this recipe (It's totally optional, of course! ), and I've found a couple of brands that don't contain onion, garlic or "spices." One is Original Louisiana Hot Sauce, and the other is my supermarket's generic brand. 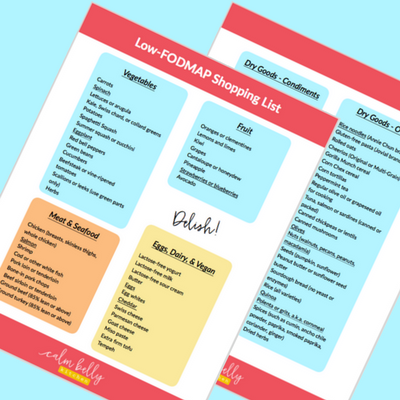 Read labels, see what you can find and let us know if you come across any other low-fodmap options! 1. Heat butter or oil in a medium saucepan on medium heat. Add rice and stir until rice is glossy and grains are turning opaque, about 1 minute. Add water and salt and bring to a boil on high heat. Reduce heat to lowest setting and simmer, covered, until rice is tender and liquid is absorbed, 50 to 55 minutes. Remove from heat and rest for 10 minutes with the lid on (this completes the cooking and helps any stuck-on rice release from the bottom of the pot). 2. Transfer rice to a large bowl. Stir in salsa and hot sauce if using. Adjust seasoning to your taste and serve immediately. Leftovers keep in the refrigerator for about 3 days.